Thailand is a popular destination for both backpackers and travelers with a holiday package. Since the country has so many different and beautiful destinations to offer, it is not easy to set a perfect travel route for Thailand. Do you want to experience the north with culture and landscape or the beautiful beaches in the south? 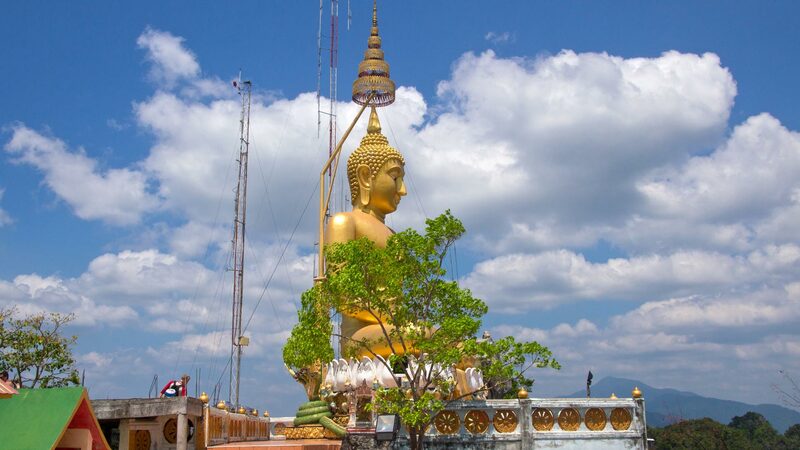 Popular are combinations from the north and south for an itinerary in Thailand. Furthermore, Thailand offers a delicious and varied cuisine, which is a must try. We think it’s one of the best in the world. In this article we would like to give you some inspiration and introduce you to an itinerary for 4 weeks in Thailand. Of course you can still vary the route yourself, but maybe it will help you deciding where to go in Thailand. There are several ways to get to Thailand. Bangkok, with its two airports, Suvarnabhumi (BKK) and Don Mueang (DMK), is the first destination for most travelers in Thailand. But you can also travel to Thailand via places like Phuket, Krabi, Chiang Mai, etc. An overview of the airlines, times and destinations can be found on Skyscanner. If you want to travel from one destination to the next within Thailand, there are also several ways of transportation. These include domestic flights, trains, buses and also the ferries, which are the only way to reach some islands. The various options can be found at our partner 12go.asia, including tickets, prices and times. The capital of Thailand is usually the first place travelers to the Land of Smiles see. Either you love it or hate it, in this point opinions differ a lot. I love the city because it has so much to offer, from mesmerizing temples, awesome sky bars, river cruises, to bustling markets and a lavish nightlife. I would advise you to spend a few days in the city at the beginning of your trip and just get yourself into Bangkok. It’s crazy, but completely different than Europe. In addition, from there you have lots of convenient ways to travel to various other locations in Thailand. 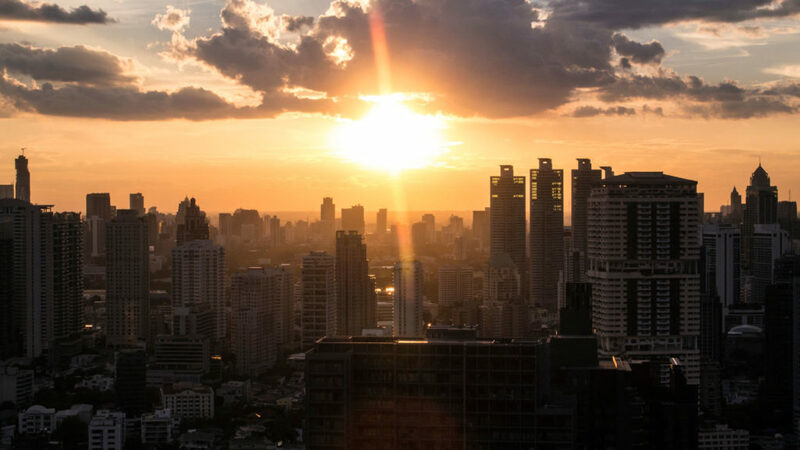 Do you still need a some impressions of the city, then check out our Bangkok video. I also recommend our guide about 20 things you should do in Bangkok. There you will definitely find the right activities for you. If you don’t want to explore the city on your own, there are also many exciting guided tours of Bangkok or the surrounding area. Ayutthaya was the capital of the ancient kingdom of Siam and shines today through some well-preserved temples and ruins. 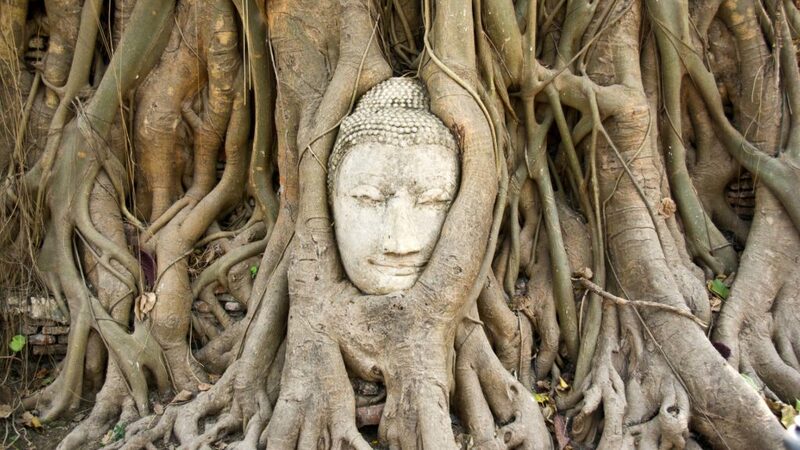 The Historical Park of Ayutthaya is located about 70 kilometers north of Bangkok and is a beautiful place to explore. You can either visit it on a day trip from Bangkok or take the train from Bangkok to Ayutthaya and spend a night there. A particularly beautiful temple with large Chedis and Buddha statues is the Wat Yai Chai Mongkhon. In addition, the Wang Luang, the old royal palace, the Wat Ratchaburana with its walk-in crypt or the Wat Mahathat with the famous into a fig tree grown Buddha head are interesting. 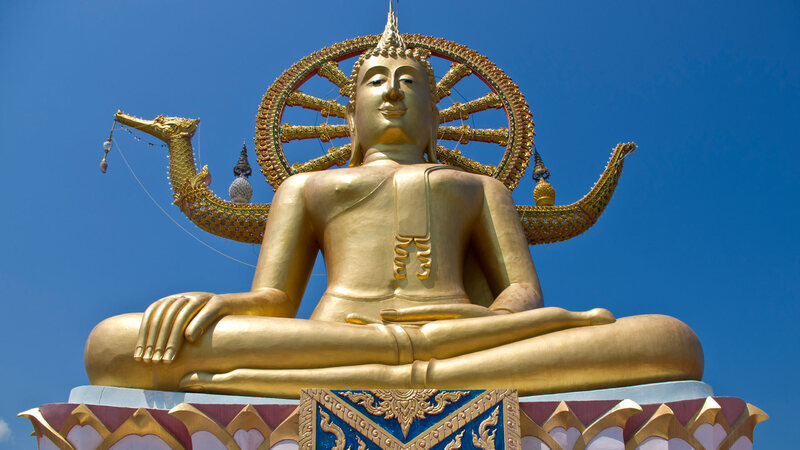 You can discover many beautiful ruins here and get an insight into the culture of Thailand. Chiang Mai is one of the most popular travel destinations next to the beautiful beaches of Thailand. The city offers visitors a great deal of culture with its countless temples and markets. 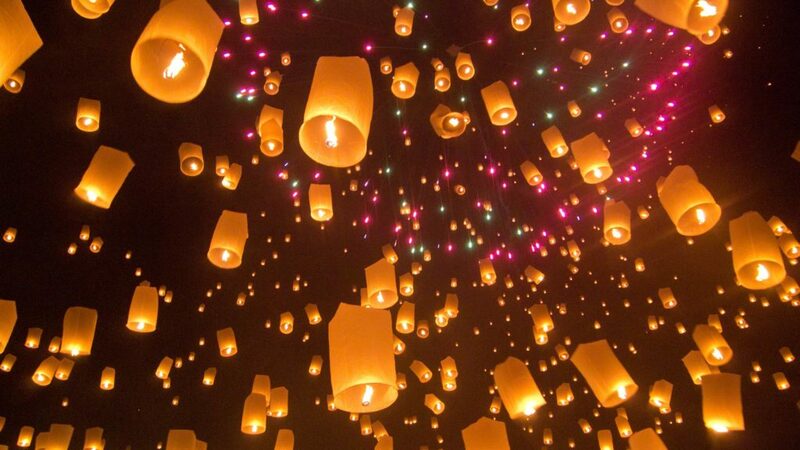 Chiang Mai is well-visited, especially for the Thai Festival of Lights Loy Krathong as there are parades and many other festive activities for visitors. The Doi Inthanon, the highest mountain in Thailand, is also nearby and is a popular destination for day trips. You should plan enough time for your stay in Chiang Mai, because you can discover a lot and let yourself be fascinated by the city. We’ve spent a few months in Chiang Mai and got to know the sights and activities. Furthermore, the city is great for meeting other travelers and a favorite place in the ever-growing digital nomad scene. By the way, the overnight train from Bangkok is a good way to get to Chiang Mai. 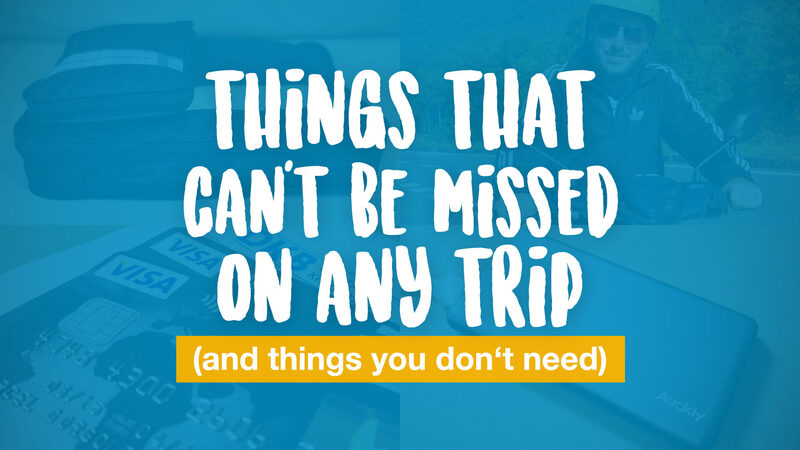 You will even save an overnight stay and arrive in the city the next morning. Further north of Chiang Mai, you can visit the town of Chiang Rai. 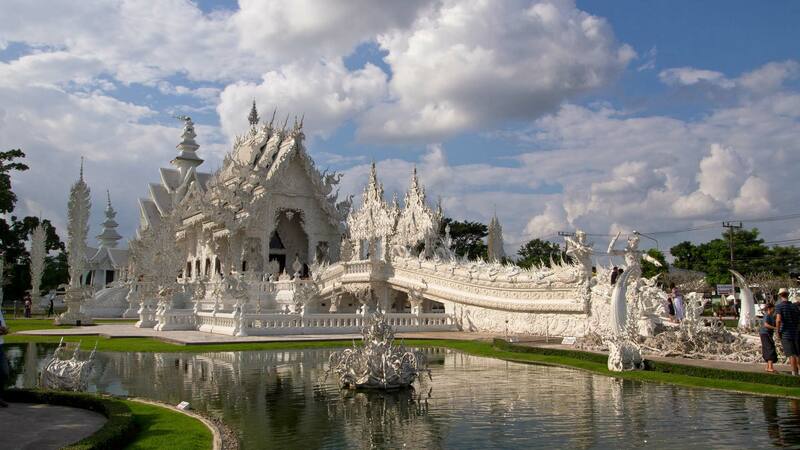 While many travelers just stop by to see the Wat Rong Khun, also know as the White Temple, the place has much more to offer. These include e.g. Baan Dam, the black house, which is the equivalent of the White Temple, the Wat Phra Kaeo, where the original statue of the Emerald Buddha was found, the daily night market or the impressive golden clock tower. If you take a closer look, there is no lack of sights in Chiang Rai. You can reach Chiang Rai from Chiang Mai with the company Greenbus in about 3 hours. On site, we recommend renting a scooter to explore the city on your own. Krabi Town is often visited only as a transit town on a trip to the many beautiful islands of the Krabi region. Of course, island hopping in Krabi is more popular than in another Thai places. But Krabi Town has at least one real highlight to offer! The Wat Tham Suea, or simply known as the Tiger Cave Temple, is a temple complex with a huge Buddha statue perched high on a mountain. You have to climb 1237 steps to the top. Although this is a sweaty activity, in the end you will be rewarded with an amazing view and a fascinating temple. If you spend a day in Krabi Town you should definitely visit the night market, too. In addition it is a good base to travel popular islands such as Koh Phi Phi. Koh Phi Phi is one of the most popular islands, even if it is partly overcrowded. Of course, this is because the legendary movie The Beach was filmed here and the scenery attracts many travelers. Koh Phi Phi actually consists of two islands, Koh Phi Phi Don, the main island, and Koh Phi Phi Leh. You could definitely call Koh Phi Phi Don a backpacker stronghold. There are plenty of hostels and nightly entertainment in the bars and the beach is always provided. But there is much more to discover on Koh Phi Phi Don. 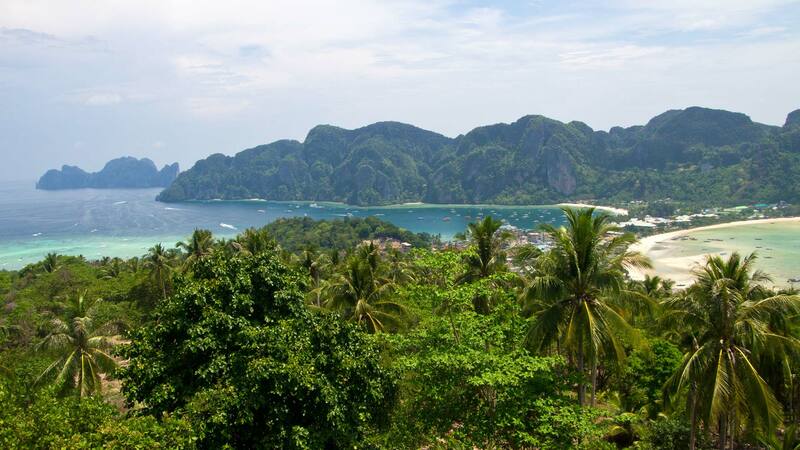 From the popular viewpoints to the gorgeous Long Beach with views of Koh Phi Phi Leh. Koh Phi Phi Leh is the smaller of the two islands and doesn’t have any accommodation, but the famous Maya Bay. You can do day trips from Koh Phi Phi Don to the neighboring island. It’s best to start very early in the morning so that the beach is not overcrowded. Additionally, Koh Phi Phi Leh offers other highlights like the smaller but beautiful Lo Sama Bay or the Viking Cave. From Koh Phi Phi there are also boats to other islands or back to the mainland. From there you can go to Phuket, Koh Lanta, back to Krabi Town or Ao Nang. This route continues to Ao Nang for island hopping. Ao Nang is the main resort of the Krabi region and is not that far from Krabi Town. While there are many mainland beaches in Ao Nang, restaurants, bars and various shopping options, many travelers mainly visit the town for the gorgeous surrounding islands. 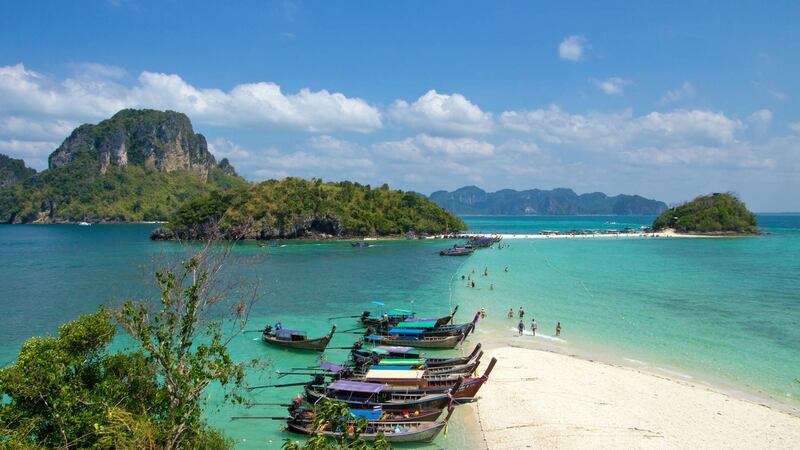 Popular are the beaches of Railay, Tonsai or the Phra Nang Cave Beach. Those beaches are all situated on the mainland, but you still have to take a boat, as there is currently no road connection. Just as taking a boat to the offshore islands, this is very easy in Ao Nang. On the beach there are small ticket booths that sell trips to the beaches and islands. Some of the beautiful islands are Koh Poda, Chicken Island, which is connected to Tub Island by a sandbank, or the further off located Hong Island. They all have white sandy beaches and a turquoise clear sea in common as well as they are perfect for a day trip. From Ao Nang we continue by bus and then by ferry into the Gulf of Thailand to Koh Samui. Tickets are available from 600 baht in many travel agencies along the main street of Ao Nang or online on 12go.asia. Koh Samui is the third largest island in the country and is located in the Gulf of Thailand. While many visitors with a package holiday come to Samui, still many individual travelers find their way to the diverse island. 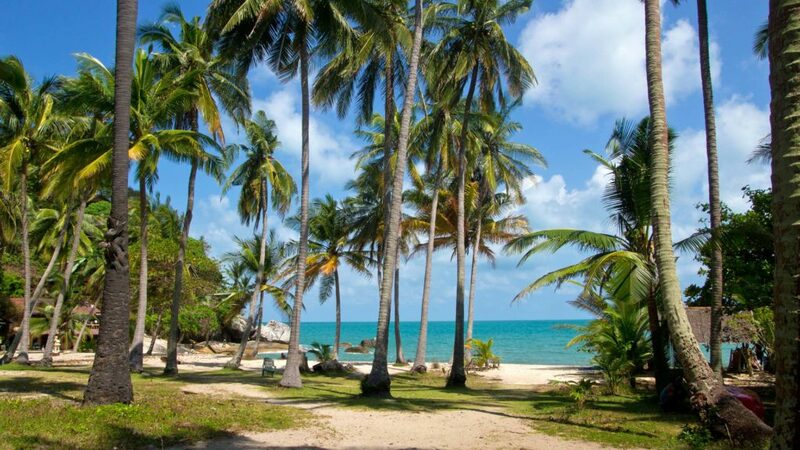 The Coconut Island, as Koh Samui is also called, offers countless beaches, fascinating temples such as the Big Buddha or Wat Plai Laem, many activities and attractions like the Grandfather and Grandmother Rock or the Tarnim Magic Garden and a thrilling nightlife. In addition, there are many tours over the island and you can also use Koh Samui as a base for tours to the surrounding islands. One of the most popular tours takes you to the Ang Thong Marine National Park. An insiders’ tip is the tour to Koh Madsum and Koh Taen. From Koh Samui you can take a boat from different piers starting at 200 baht to Koh Phangan. The main pier in Nathon offers good opportunities, but also the Lomprayah Pier in Maenam or the Seatran Pier in Bangrak are options to get to Koh Phangan in about 30 minutes. By the way, if you want to book your tickets conveniently in advance, you can easily do that on 12go.asia. Koh Phangan is the closest island to Koh Samui in the Gulf of Thailand. 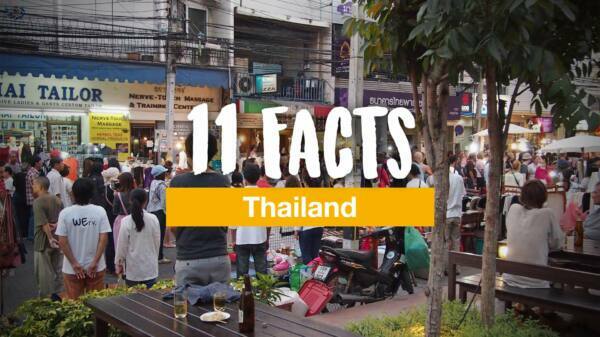 Of course it is especially known for the monthly Full Moon Party. Many visitors only travel to Phangan to participate in that very party and just stay a few days on the island. But Koh Phangan is more than just Full Moon Party. 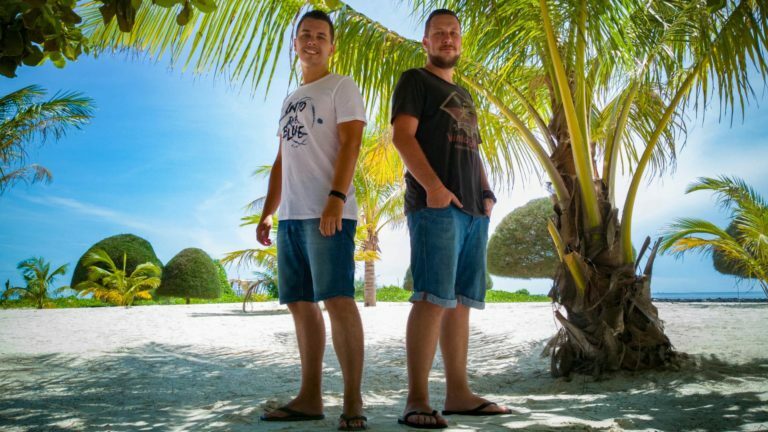 When you arrive outside the Full Moon Party dates, or stay longer afterwards on the island, then you can explore a lot of places calmly. There are beautiful viewpoints and waterfalls, fascinating temples, some great sunset bars and much more. But Koh Phangan doesn’t just have a few attractions to offer. You can do many activities while staying on the island like visiting the Ang Thong Marine National Park, hike to Khao Ra, kitesurfing, attend a cooking class, slip-and-fly or visit some of the island’s fabulous beaches. 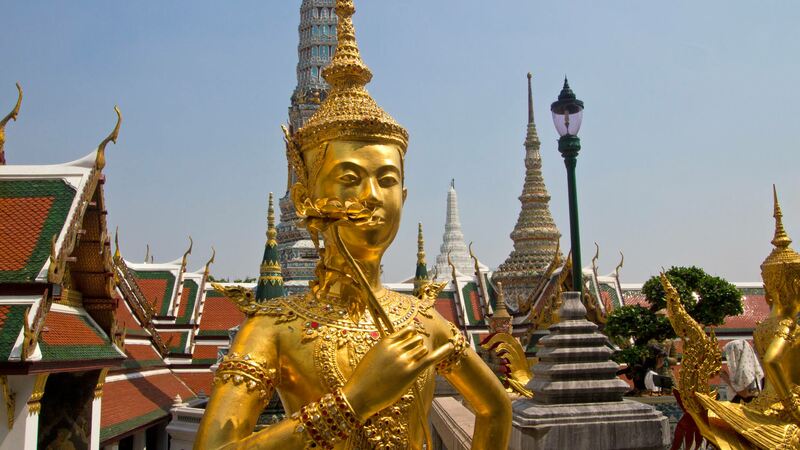 Do you have any questions or comments about our Thailand itinerary? Just leave it in the comments. Want to travel to Chengdu after Koh Samui Chiang Mia. Any recommendations from there? Possibly Hanoi or Lhasa or ?? As we’ve never been to Chengdu, we actually don’t know about connections from Thailand. Best way would be to check here on Skyscanner.